Engcon has joined with Kobelco Construction Machinery and Leica Geosystems to develop a unique feature that provides automatic tilt function for the tiltrotator, in combination with an automatic stick, boom and bucket function. Engcon has joined with Kobelco Construction Machinery and Leica Geosystems to provide an automatic height and tilt function on its Kobelco tiltrotators. Engcon is a leading manufacturer of tiltrotators — a kind of tilting and rotating quick coupler for excavators. The three firms together developed a unique feature that provides automatic tilt function for the tiltrotator, in combination with an automatic stick, boom and bucket function. This means the Kobelco excavator, and its Information and Communication Technology (ICT) system, automatically provides the needed height and tilt to the bucket, dramatically increasing the efficiency of the excavator, according to the manufacturers. 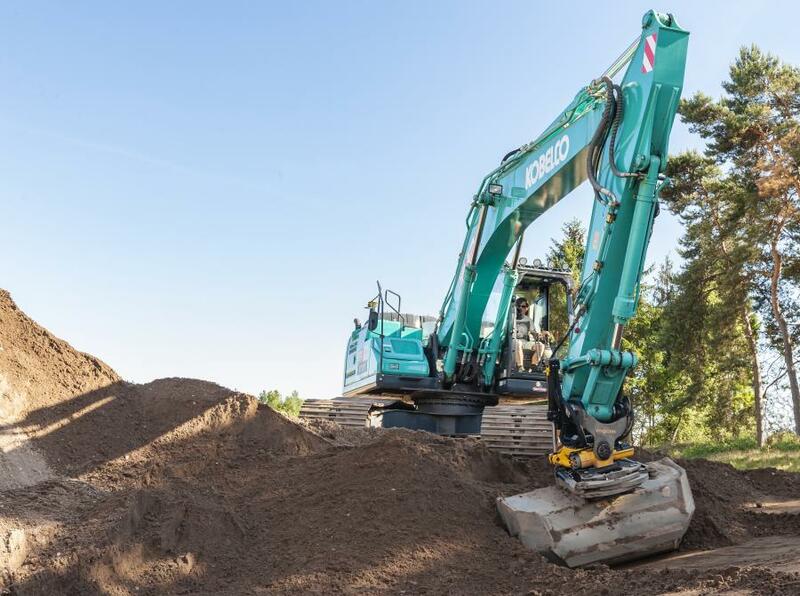 Kobelco Construction Machinery will begin to sell the feature on its excavator SK200/SK210-10 in the spring of 2019. This is the first manufactured model with the new ICT system. "We are incredibly proud to have participated in this project with Kobelco and Leica Geosystems. I'm sure this is the beginning of something bigger in the industry," said Krister Blomgren, CEO of Engon Holding. Engcon, has been manufacturing and selling its tiltrotators, quick couplers, control systems and tools for excavators throughout Europe and Australia for 27 years, and in North America for 11 years through dealers. Engcon is a world leader in tiltrotators and their attachments for excavators. Engcon is a privately-owned group with its parent company, Engcon Holding AB, based in Stromsund, Sweden. In 2017, the Engcon Group achieved $110 million in sales with 260 employees. The company was founded in 1990. Kobelco Construction Machinery, based in Japan, is one of the world's largest excavator manufacturers. Leica Geosystems, based in Switzerland, produces products and systems for surveying and geographical measurement.